Finest quality high silver content printing metal, polished and laminated for scratch free surface. Finest quality high silver content printing metal polished and plastic laminated for scratch-free surface. Etch with ferric chloride. Polymer Plate – Pre-sensitized (Printight). Zinc plates are softer than copper and more easily modified by scraping, burnishing and drypoint techniques. They may be etched in ferric chloride. School and beginners plastic drypoint plates. Available in clear thick plastic to test ink out while working. Usable both sides. All etching tools may be used including needles, roulettes, scrapers, burnishers. For fastest results use an easy wiping ink like Faust Jet Black Ink. Available per pack. 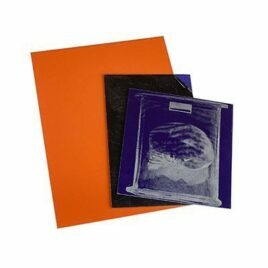 Similar to above item, but with both sides protected by removable thin blue polythene cover sheets to guarantee a perfect scratch-free surface. Note that the plastic is harder, being a better grade than E008 above. Per pack. An acid-free etching process for those sensitive to dangerous chemicals. Made from steel-backed photosensitive polymer which is water-soluble. Exposure to UV light makes these areas waterproof. Developing the plate in warm water washes out unexposed areas to create an etching or relief plate. This process gives excellent ink receptivity. Develop quickly using a brush to remove the unexposed portion. Dry, then harden the plate in sunlight. (Data sheet available). 1.2mm polished front, for etching, editioning, etc, with acid-proof paint on back. Plastic laminated for a scratch-free surface. 1.2mm (18G) each sheet wrapped in black plastic. Develop zinc at 300° heat in solvent free developer after approximately 10 minutes exposure to sun lamp or 2 minutes in sunlight.